You would think only children enjoy the pillowy, soft, chewy and fluffy marshmallows but we adults would take a very hard heart not to have them too! While, one would believe they are unrealistically possible to make at home, they are not! Marshmallows are super easy and above everything, very fun to make if you plan on doing them with children around! I promise you'll never ever buy store-bought marshmallows again unless you're in the hurry. But if you do plan days before, you won't have to! The cherry on the cake is that, you'll never throw leftover egg whites again. How cool is that!? Note: Multi-tasking is vital here! Forget your phone, the tv, the chats and your cats, whatever!! and always keep an open eye! And please, please, read the whole recipe before any attempt. 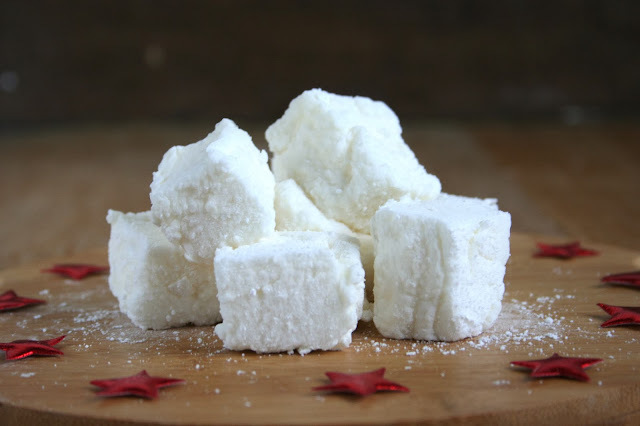 Wow Everyone with this Fluffy, Pillowy, Chewy and Soft Homemade Marshmallows! Soak gelatin sheets in enough water and let soften for 5 minutes. In the stand mixer, beat the egg whites and pinch of salt on medium low speed. Bring the sugar and the water to a simmer on medium low heat. (Do NOT stir). When the temperature rises to 110˚C, increase the speed of the stand mixer to medium to obtain stiff peaks. At this point, drain the gelatin sheets and pour in a glass along with the 2 tbsp of hot water. Using a spoon, melt the gelatin sheets. Keep aside. When the temperature is finally at 120˚C, remove the saucepan from heat. With the mixer still beating the egg whites (now with stiff peaks), pour the syrup onto the side of the bowl of the stand mixer. Keep beating. Add the gelatin and the vanilla essence. Sift and mix the corn starch and icing sugar together. Cover the bottom of the square pan with the icing sugar mixture. Pour the marshmallow in the square pan and let set for atleast a 5 hours or a day for better results. When set, cut the marshmallows in any shape you would like, and dust all around with the icing sugar mixture! A candy thermometer is an absolute must-have here! I for myself have never used one before and wouldn't bear the risk of messing up! If you can't afford one, or can't find one, I suggest you do the cold water-test to know if the syrup is at the right temperature. You could check this quick guide to help you. I strongly recommend using a stand mixer here, because there's a lot of beating involved. A hand mixer will not make it! From a few feedbacks, the mixture of the icing sugar and corn starch is still sweet, I would advise reduce the icing sugar to 1/4 cup and increase the corn starch to 3/4 cup. Or you could use 1 cup of corn starch. which I plan to do next time! Instead of the square pan you could use a sheet pan, or could use a piping bag to pipe dollops. When pouring the syrup into the bowl of the stand mixer, you should make sure it doesn't drop onto the whisk. The bowl of your stand mixer might not feel completely cool, that is fine. But it should not feel warm/hot. Lukewarm is fine. You could prepare the marshmallows one week before and store it in an air-tight container.